Today I’m taking a look at the newest member of Sigma’s trio of lenses for mirrorless cameras, the 60mm f/2.8 DN Art, which is available for Sony E-mount and Micro 4/3. The 60mm keeps a similar body style and the same f/2.8 maximum aperture as the 19mm and 30mm lenses that preceded it. The DN series has a reputation for low-cost and high optical quality, and the 60mm f/2.8, which is priced at a mere $239, hopes to match or exceed the other two lenses in this new line. 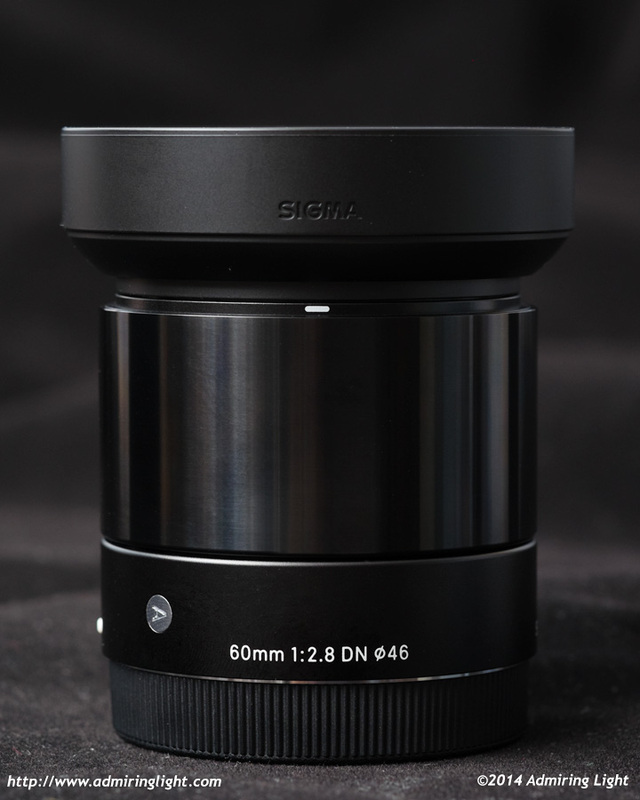 The Sigma 60mm f/2.8 DN Art is built with the same body construction as the other two DN Art lenses. The 60mm is a compact and lightweight lens with a thin metal shell in a two-tone black or silver finish and a metal mount. The copy reviewed here is the black model. The base of the lens shell is a matte finished black with a silver inset ‘A’ for the ‘Art’ designation. The rest of the lens body is taken up by the broad focus ring, which is finished in a very shiny black paint. While the overall effect looks fantastic, the smooth shiny black finish on the focus ring is quite prone to fingerprints. The lens includes a nice lens case as well as a lens hood. In another appreciated twice, the three DN primes all utilize the same hood and lens caps, allowing you to bring one and share if desired. The focus ring turns smoothly and has a bit of damping to provide a nice manual focus feel when using the ring. The lens is a bit longer than the other two Sigma mirrorless primes, but it’s still a small and lightweight lens that will handle beautifully on any of the E-Mount cameras. The lens also shares the same floating focus group with the other two lenses, which will rattle when the lens is jostled and the camera is off. While the construction isn’t up to the standards of a pro-grade lens, it is tightly assembled and quite well-built considering the low price. The Sigma 60mm features a very quiet and relatively fast autofocus motor. The focusing is notably faster than that of the Sigma 30mm f/2.8, though it falls short of the fastest lenses available for E-mount. still, focus is quick and very accurate in single shot mode. Unfortunately, the Sigma 60mm doesn’t appear to be compatible with the phase-detect focusing in recent Sony cameras, and as such doesn’t provide a good experience when shooting on continuous autofocus. Some have mentioned that it will work with the center AF point, but I was unable to get the camera to track focus on a moving subject with the 60mm f/2.8. Great to read another one of your good (I.e. well-done) reviews. Since I have one friend who doubted me when I said i thought my 60mm Sigma was sharper than my 45mm Olympus (same effective focal length on my E-M1 as the 60mm on my NEX 6) I smiled when I read how sharp you found this sigma to be… And you shot it on a 20mp camera! Did you check if there’s any update for the lens on the NEX6? I think there was an update for the 30mm version that allows PDAF to work in the center (Just 5 points). I know that A6000 (Which I have) has the update already installed on the camera, and I can use PDAF (Again only 5 dots in the center) using my 30mm Sigma 2.8. I have this lens together with the 30/2.8. it is really as good as you say. Now, I wonder if IQ of A6000 + Sigma 60/2.8 match the IQ of A7 + FE 55/1.8 at base ISO for static shots with better perspective and wider depth of field. 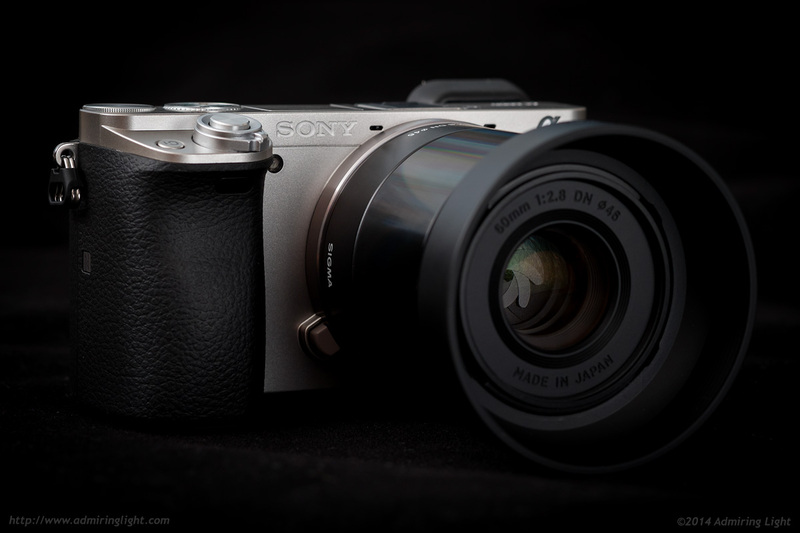 Very nice review, I intend to buy the Sigma 60mm f/2.8 DN Art and the 30mm for my A6000. I just wish they had image stabilization, since Sony’s “E” mount bodies don’t have it! I am buying the Sony a6000 and like what I read about the sharpness of the Sigma 30mm & 60mm. In practical use is the 5-point PDAF limitation on Sigma lenses adequate for AF tracking of people in street photography? Is the lack of image stabilization on the Sigma 60mm much of a factor when hand-holding in street photography? Very close to purchasing the a6000. Would like to start with one lens. Thinking either the standard 16-50 kit, the Sigma 30/2.8, or the Sony 35/1.8. Any real world advice? Currently not into video, but that may change with the 6000 later. Also, anyone have any thoughts on using Canon EF mounts with adapter on the 6000 or would I be better selling them off and going with lenses designed for mirrorless? I understand they will be manual focus only. If you’re going to be using this as a main camera, the Sony 35/1.8 is the way I’d go. I have both the 35/1.8 and the Sigma 30mm, and while the Sigma 30 is brilliant (especially for the price), the extra aperture and optical stabilization is nice to have. At f/2.8 they are close to each other optically. Don’t put away your 16-50 Kit lens, do your DDs on Flickr, on Sony A6000 group and others, you wills it is not a perfect lens but not a bad lens. Thanks for the real-world reviews! I am considering this Sigma 60mm vs. the Sony 50mm f1.8 for my a6000. Have you given the Sony a try, and if so, what differences have you found? I too am very interested in this comparison, any input from anyone would be greatly appreciated. cheers! I’m torn between these two lenses as well. I agree it is not an easy decision. 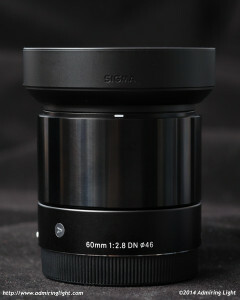 Finally, i decide for the Sigma 60mm, a perfect portrait lens. As Jordan mention it is very sharp at f/2.8. The question is The Sony 50mm at f/ 1.8 it is as sharp as the Sigma 60mm at f 2.8? Is the sharpness of the Sony 50mm have to reach f/ 2.8 to get the same quality as the Sigma 60mm? So If U have two SONY camera such as A6300(APSC) & A7ii(Full Frame like me, U will choose to get Sony 50mm F1.8 for sure. In fact, the firmware available now do support Phase Detection Focus mechanism. I know a few others asked the same question, but I’m curious about your opinion on the lack of image stabilization (when used on a6000 since it has no IBIS). Does this have a huge affect on shooting in low light? Pingback: ???????????????? 60mm F2.8 DN??????? | ????????????? Pingback: ?? ?60mm F2.8 DN??????????????????????????? | ????????????? Pingback: ??? ?60mm F2.8 DN? ? ????????????????? ? ????????? ?